Can someone clarify what this question means? Or how to attack this type of question? Thanks! We call these nasty ones Rule Equivalency. Over the last 20 tests, there has been one of these per Games sections. They're sometimes fine and sometimes miserable. I'm comfortable skipping them and saving them for last if nothing jumps out on the first pass. The question stem is just asking, "Which of these answer choices could we put in place of Rule 2 and have the exact same game?" I start with Too Restrictive thinking, because you can use previous work to analyze that. For (A), for example, it's saying that every time F is 7, H is 2. Check your previous scenarios -- if you have any scenarios where F was 7 but H was not 2, then you can eliminate this answer. If an answer survives the Too Restrictive filter, then I ask myself, "Would this do the work of the rule being replaced?" In this case, examining (A), would this rule force H to be before K and prevent H from being 1? Doesn't look like it! If F is 7, then H can't be 1, and H would come sometime before the GK chunk. But ... if F isn't 7, then all bets are off. Nothing would prevent H from being 1st or from H coming after K.
The F - H - K graphing of answer choice (E) looks good to me. I was reading the word "which" in the answer choice as referring to H. So K is after H and H is after F.
(E) definitely "does the work" of the rule we're getting rid of, since F - H - GK guarantees that H is before K but not 1st. However, F - H - GK does not give us a game identical to the game we were playing up until that question, because in the actual game, F can be 1 or 7. This question is an outlier, when it comes to Rule Equivalency. It is by far the hardest one I know of, and you never could have predicted the mechanism the correct answer uses. (D) Unless Hibiscus is second, it must be somewhere between Magnolia and Gardenias. If H isn't 2nd, then it's somewhere between M and G.
H is before K, but H can't be first. Does the rule in (D) achieve the effect that "H can't be first"? The trigger is "If H isn't 2nd". If H is 2nd, then it obviously can't be first. If H isn't 2nd, it's between M and G, so it can't be first. That part checks out. Does this rule force H to be earlier than K? If H is 2nd, then H is before K, since the GK chunk would have to come later. M - H - GK. 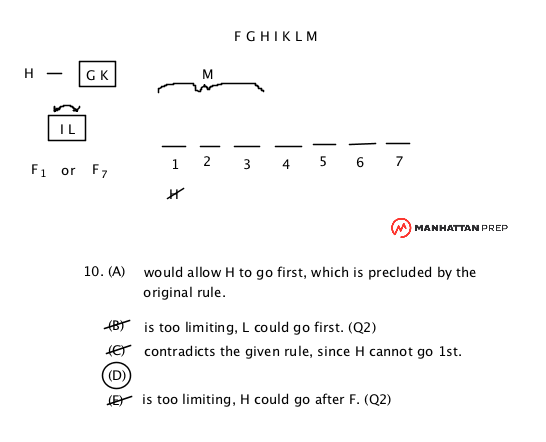 In the M - H - GK possibility, H is before K.
The GK - H - M possibility is actually NOT a possibility, because it violates the rule that M has to be in the first three spots. Let me reiterate that THIS ANSWER CHOICE IS A UNIQUE FLAVOR OF MISERY. that makes sense, now, thank you! I won't stress too much knowing it's that difficult of a question, but understanding it feels helpful. So this is the only question out of the set that I have a super hard time understanding, even after reading the above explanations. Is this question type relatively uncommon (AKA, can I get away with not knowing how to do this because it's stressing me out)? You can/should be thinking that Equivalent Rule questions are usually harder than an average Games question, so it's sensible to think that we might live with eating that missed point, if it saves us time and allows us to get more attainable points later in the section. I am very willing to circle one of those and come back (kind of like long Matching questions in Logical Reasoning ... I'd rather save them until I've done all the other questions in the section). THIS PARTICULAR Equivalent Rule question is BY FAR the meanest ever. Many correct answers to Equivalent Rule are WAY EASIER than this is. So you can definitely have a negative prejudice against Equivalent Rule, but it can't be on the basis of THIS question, which is a total outlier. Can someone go through C for me? C is saying that H will always be in spots 2, 3, 4, or 5. 1. Was that always true before (or is this too restrictive)? 2. Following this new rule, can I break the old rule (is this new rule too permissive)? #1 is true. Since H couldn't be 1, and we had a H - GK rule, H was always going to be limited to 2, 3, 4, or 5.
and it honors choice (C). whereas the rule 2 would never allow for that. I'm on the boat that these are the worst questions ever, but for some reason I raced through this one without significant issue. (A) and (B) were quickly eliminated because Q6 answer (C) shows that both are possible. (D) was eliminated because new rule F-H-K, eliminated possibility of F going 7th. (Too Restrictive). Start with H is not 2nd. All rules appear to work, nothing new is added to game, nothing is taken away. I am confident in (D). My anxiety with these questions is I freeze and don't know what to really do to get to the answer. Normally with a confusing LG you just plug away, but these types of questions just get me frazzled. Would someone explain what my process should be with this, on a detailed level? I really hate this question type. - Was this true before? If not, eliminate. If so, keep. - Do I have any previous work that goes against this new rule? If so, eliminate. - Does this new rule do the work of the old rule? If not, eliminate. If so, pick it. 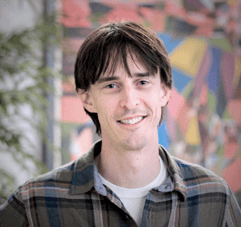 - Can I write a scenario that obeys the new rule but breaks the old rule? If so, eliminate.